We’ve taken a gander at some of the finest headphone models in 2019 and here we are with the Mpow S10 review. Basically, these headphones are fairly inexpensive, although their quality shouldn’t be perceived through the price tag. Recently we’ve published Mpow H5 Bluetooth Headphone Review as well. If you are looking for an Over-ear headphone, jump there now. So in essence, the S10 stands for a waterproof hi-fi wireless earbuds which rock a decently balanced soundstage, pack a set of high-quality features, and frankly, promise a lot for a budget set of headphones. Check more in Amazon as well. Even though it’s true that earbuds are inferior to actual headphones, Mpow’s S10 is perhaps an exception. The sound quality they offer is absolutely great concerning their price, the features they sport are humble but formidable, and generally, they perform excellently. The one thing people love about Mpow’s headphones is their sound quality, and the S10 is a good representative of what these guys can do. It seems that Mpow engineers have a tendency to set the soundstage a bit over the top when it comes to the lowest frequencies. The bass response of these headphones is incredible, especially for such a small set of earbuds. Even though the punchy feel of the lows tends to somewhat drown the mids and highs a bit, you’ll still get to hear everything. Surely enough, the bass-heavy lows did a good job on the middle section of the soundstage, but they’re capable of breaking through. Speaking of mids, they’re quite bright and somewhat more pronounced when compared to an average earbud set. other times you might experience some feedback and hisses. The punchline is, the highs aren’t as stable as the rest of the soundstage. Nevertheless, the overall sound quality of S10 earbuds is awesome, so we feel bold enough to credit them 4.5/5 in this sphere without integrating any subjective preferences and opinions into the verdict. Modern headphones aren’t actually known for ‘brute quality’ – it’s the details that set them apart, and such details can only be perceived through the diversity of features different models come outfitted with. The first feature of S10 is the magnetic design. These earbuds can easily connect to each other and be worn around the neck as a sort of a necklace when you’re not using them. Secondly, let’s talk about the hi-fi tech. Basically, this piece of technology provides a peculiar sound signature, allowing you to listen to your tracks as if they were ‘flac’ editions. Let’s not forget the CVC 6.0 – the special kind of noise-canceling technology which substantially reduces the effects of ambient sound. Another great feature of S10 is the three button controller – the easy controls allow you to easily customize your listening experience, allowing you to take or end calls, skip or pause tracks, and adjust the volume of your music as you see fit. Furthermore, the construction of these headphones is lightweight. It’s safe to say that you won’t even feel them once you start using them. They’re rated IPX7 in terms of water resistance, but it would be proper to call them ‘waterproof’ rather than ‘resistant’. Last, but not least, you’ll be able to enjoy in your music for some eight hours straight, as the battery is pretty long-lasting – it can also be charged via USB cable. Considering that there are plenty of bleeding-edge technologies and features incorporated into the design of S10, it’s only natural that they deserve a nearly perfect rating of 4.5/5 features wise. Though they’re generally awesome, they come with a relatively outdated version of Bluetooth 4.1. Mpow’s S10 earbuds, better yet, earbuds, in general, are not exactly so versatile that they can be used for all kinds and types of music listening. For instance, they’re perfect for traveling and commuting as they’re lightweight, although eight hours of battery lifetime might not be enough to endure the whole trip. Critical listening goes out of the window, as you can’t really approach music in such a formal way without actual headphones. ‘Sports and fitness’ is the category that would best fit S10’s intended use. 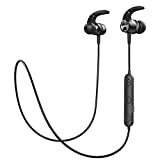 They’re waterproof, lightweight, and wireless, plus they feature the magnetic design, so you can work out all day long without even feeling them. They also might actually be good for gaming, as the soundstage is decently balanced and you won’t suffer from ear fatigue due to high clamping pressure (since there is none). So, performance wise, we give Mpow’s S10 the rating of 4/5. Though they’re not generally all that versatile, people who are looking for earbuds shouldn’t miss out on them. 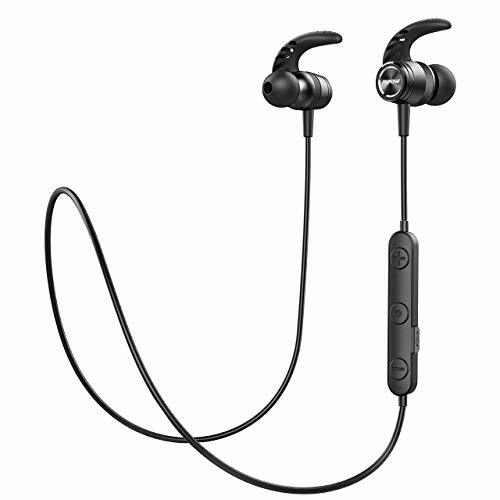 A decent set of drivers, technologies that are easy to integrate in its construction, as well as several other factors have all mixed up in a combination of quality that resulted in these relatively cheap, yet formidable earbuds. The S10 belongs to the medium bracket of the ‘affordable’ price point category, and it would only be fair to rate their affordability 4.5/5. There’s plenty to like about these amazing headphones, but our Mpow S10 review also includes several things that you should be aware of that you might not like as much. Lightweight construction – S10 can barely be felt when you’re using them, which makes them perfect for workouts and travel. Waterproof design – these headphones were specifically designed for all-weather purposes. Mpow’s S10 are budget earbuds of exceptional quality. Though there are certain things that leave some room for improvement, they do a major bang for the buck. As a special note, We would like to Thank to Mpow for sending us the sample copy of Mpow S10 to test and review.